DIE Martis, 5 die Februarii. Message to H. C. with it, and other Bills. L. Widdrington, Privilege: Smith and White to be attached, for driving his Cattle out of Ellington. Messages from H. C. with Bills; and to return the Poor Prisoners Bill. Message from H. C. for a Conference about L. Mordant's Trial. DIE Martis, 5 die Februarii, post meridiem. 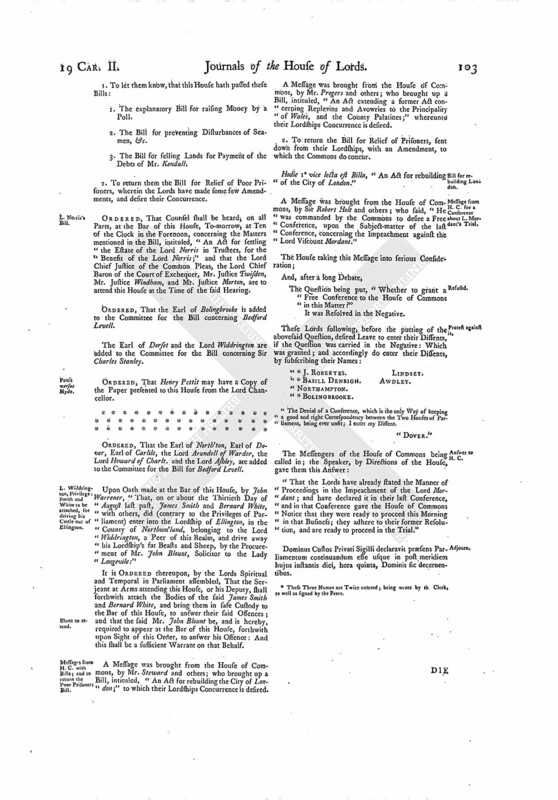 Bill for rebuilding the City of London. The Earl of Bridgwater reported, "That the Committee have taken into Consideration the Bill to prevent Disturbances of Seamen, &c. and think it sit to pass as it is, without any Amendments." Hodie 3a vice lecta est Billa, "An Act to prevent the Disturbances of Seamen and others; and to preserve the Stores belonging to His Majesty's Navy Royal." The Question being put, "Whether the Bill shall pass?" 1. The explanatory Bill for raising Money by a Poll. 2. The Bill for preventing Disturbances of Seamen, &c.
3. The Bill for selling Lands for Payment of the Debts of Mr. Kendall. 2. To return them the Bill for Relief of Poor Prisoners, wherein the Lords have made some few Amendments, and desire their Concurrence. ORDERED, That Counsel shall be heard, on all Parts, at the Bar of this House, To-morrow, at Ten of the Clock in the Forenoon, concerning the Matters mentioned in the Bill, intituled, "An Act for settling the Estate of the Lord Norris in Trustees, for the Benefit of the Lord Norris;" and that the Lord Chief Justice of the Common Pleas, the Lord Chief Baron of the Court of Exchequer, Mr. Justice Twisden, Mr. Justice Windham, and Mr. Justice Morton, are to attend this House at the Time of the said Hearing. ORDERED, That the Earl of Bolingbrooke is added to the Committee for the Bill concerning Bedford Levell. The Earl of Dorset and the Lord Widdrington are added to the Committee for the Bill concerning Sir Charles Stanley. ORDERED, That Henry Pettit may have a Copy of the Paper presented to this House from the Lord Chancellor. ORDERED, That the Earl of North'ton, Earl of Dover, Earl of Carlile, the Lord Arundell of Warder, the Lord Howard of Charlt. and the Lord Ashley, are added to the Committee for the Bill for Bedford Levell. Upon Oath made at the Bar of this House, by John Warrener, "That, on or about the Thirtieth Day of August last past, James Smith and Bernard White, with others, did (contrary to the Privileges of Parliament) enter into the Lordship of Ellington, in the County of Northum'land, belonging to the Lord Widdrington, a Peer of this Realm, and drive away his Lordship's fat Beasts and Sheep, by the Procurement of Mr. John Blount, Solicitor to the Lady Longevile:"
It is ORDERED thereupon, by the Lords Spiritual and Temporal in Parliament assembled, That the Serjeant at Arms attending this House, or his Deputy, shall forthwith attach the Bodies of the said James Smith and Bernard White, and bring them in safe Custody to the Bar of this House, to answer their said Offences; and that the said Mr. John Blount be, and is hereby, required to appear at the Bar of this House, forthwith upon Sight of this Order, to answer his Offence: And this shall be a sufficient Warrant on that Behalf. A Message was brought from the House of Commons, by Mr. 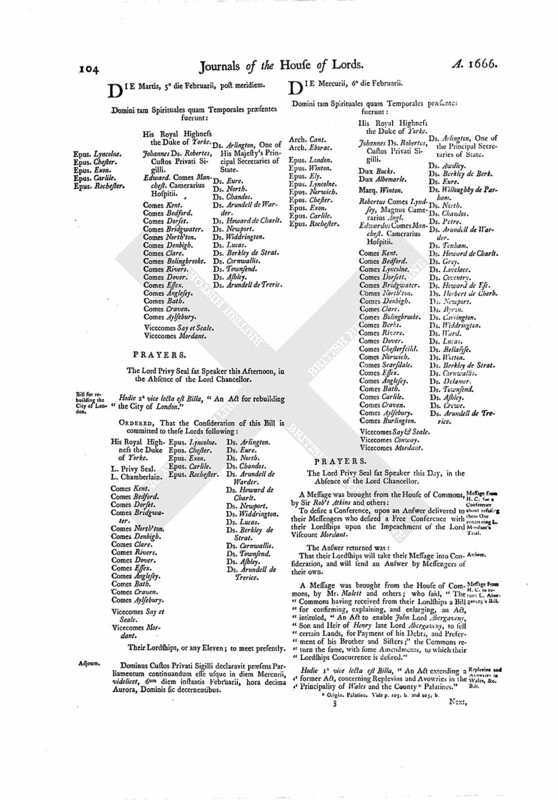 Steward and others; who brought up a Bill, intituled, "An Act for rebuilding the City of London;" to which their Lordships Concurrence is desired. A Message was brought from the House of Commons, by Mr. Progers and others; who brought up a Bill, intituled, "An Act extending a former Act concerning Replevins and Avowries to the Principality of Wales, and the County Palatines;" whereunto their Lordships Concurrence is desired. 2. To return the Bill for Relief of Prisoners, sent down from their Lordships, with an Amendment, to which the Commons do concur. Hodie 1a vice lecta est Billa, "An Act for rebuilding of the City of London." A Message was brought from the House of Commons, by Sir Robert Holt and others; who said, "He was commanded by the Commons to desire a Free Conference, upon the Subject-matter of the last Conference, concerning the Impeachment against the Lord Viscount Mordant." The Question being put, "Whether to grant a Free Conference to the House of Commons in this Matter?" " (fn. 1) J. Robertes. "The Denial of a Conference, which is the only Way of keeping a good and right Correspondency between the Two Houses of Parliament, being ever unfit; I enter my Dissent. "That the Lords have already stated the Manner of Proceedings in the Impeachment of the Lord Mordant; and have declared it in their last Conference, and in that Conference gave the House of Commons Notice that they were ready to proceed this Morning in that Business; they adhere to their former Resolution, and are ready to proceed in the Trial." Edward. Comes Manchest. Camerarius Hospitii. Vicecomes Mordant. Ds. Arlington, One of His Majesty's Principal Secretaries of State. 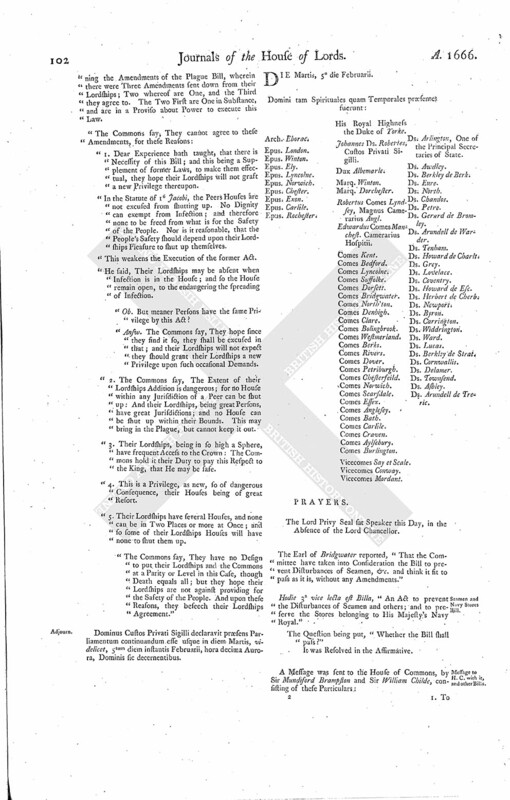 Hodie 2a vice lecta est Billa, "An Act for rebuilding the City of London." Their Lordships, or any Eleven; to meet presently. Dominus Custos Privati Sigilli declaravit præsens Parliamentum continuandum esse usque in diem Mercurii, videlicet, 6um diem instantis Februarii, hora decima Aurora, Dominis sic decernentibus. 1. These Three Names are Twice entered; being wrote by in Clerk, as well as signed by the Peers.